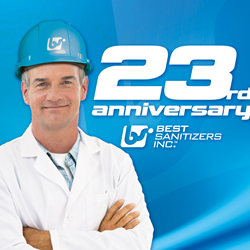 Best Sanitizers, Inc. Celebrates Twenty-Three Years of Advancing the Food Safety Industry Through Innovative Products, Vision and Education. We’re very proud of what the company has accomplished over the last twenty-three years… and now we’re looking forward to the next twenty. Best Sanitizers, Inc., an innovator of sanitation products for the food processing industry, celebrates its twenty-third anniversary. Established in 1995, this Northern California-based company was the first to achieve an E3 rating for an alcohol-based hand sanitizer, and the first to achieve a D2 rating for an alcohol-based surface sanitizer. An early proponent of “touchless” hand soap and hand sanitizer dispensers, Best Sanitizers was one of the first companies to offer this technology to food manufacturers. These early innovations helped Best Sanitizers become established as a leading manufacturer of hand and surface hygiene products for the food processing industry. Not long after its inception, Best Sanitizers’ founder and president, Hillard Witt, developed a partnership with Saraya Co., LTD, one of Japan’s largest manufacturers of health and hygiene products. “Saraya’s support and involvement has been invaluable in our ability to grow and innovate—especially in the early years” stated Mr. Witt. In 2006, Best Sanitizers cut the ribbon on a new manufacturing facility in Walton, Kentucky. The facility was expanded in 2008, and again in 2015. This cGMP, FDA and FIFRA compliant factory allows the company to develop and produce a wide range of high quality products, including their own line of Alpet, Smart-San and SoftenSure products, a catalog of private label products for some widely recognized Fortune 500 companies, and a high-level medical disinfectant for endoscope reprocessing. Today, Best Sanitizers’ products are used in over 9,000 food processing facilities in the U.S and Canada. Its Alpet D2 Surface Sanitizer, Alpet D2 Surface Sanitizing Wipes, Alpet Sanitizing Soaps and Alpet Hand Sanitizer Sprays are staples throughout the industry. For more information on Best Sanitizers, Inc., visit http://www.bestsanitizers.com.